This could be the best and most affordable backpack speaker we've reviewed. 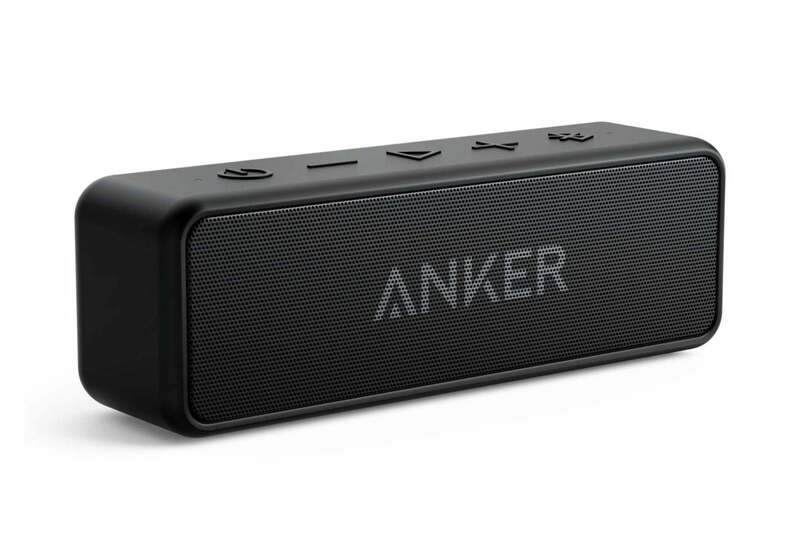 While its nigh on impossible for a speaker this small (6.6 by 1.9 by 2.2 inches) to deliver truly well-balanced sound, the Anker SoundCore 2 comes closer than any Bluetooth speaker of its stature I've heard. Indeed, it sounds better than some larger speakers I've reviewed. Additionally, it costs a mere $39 and runs for a Methuselah-like 24 hours. Color me impressed. For a backpack special, it's special. The SoundCore 2 shares the same solid construction and design ethos as the recently reviewed SoundCore A3102. It's a matte black rectangular box with front-firing speakers and rounded corners. Five buttons on top of the speaker enclosure control, in order, power, volume down, play/pause, volume up, and Bluetooth pair. A plug on the right-hand end cap shelters a micro-USB charging port and a 3.5 mm auxiliary stereo input. There's no full-sized USB port for charging other devices, which is kind of a bummer if you're lost in the woods and need to extend your phone's run time. The SoundCore 2's controls are easy to use and can control phone calls as well. The SoundCore 2 weighs just shy of 13 ounces, and it feels very solid in your hand. Given the 24-hour run time, I'm figuring a part of the weight and feel are from the battery. I personally like the heft, but ounces count in the backpack. Then again, so does endurance. If you understand the difference between the audio colloquialisms "punch" and "thump," you know the difference between the Anker SoundCore 2 and its larger SoundCore Boost cousin ($79 at Amazon. We'll post a review of that speaker soon.) The SoundCore 2 has the former, while the SoundCore Boost offers both (with its bass boost enabled, that is). Apart from that, the two speakers are near sonic twins. The SoundCore 2's low end rolls off (diminishes) somewhere around 150Hz, but if you put your hand on it, you can feel it trying. You can certainly hear things like the bass and the kick drum (it's not a laptop for goodness sakes), just not in their fully bottom-y glory. Beyond that, there's a decent amount of high end, which is always a bit surprising in a water-resistant speaker (Anker rates it IPX5, which means it's not rated for dust ingress, but it's protected from water spraying from up to a 6.3mm nozzle). The SoundCore 2 packs lots of volume for its size and 6-watt rating, but once you exceed "listen while you're working" levels (i.e, pretty quiet), the mids start to get a bit harsh. Pushing smaller drivers like these, especially a stereo pair separated by only a few inches, rarely does their sound much good. That said, everyone within a decent radius will be able to hear it and tell what's going on. The SoundCore 2 ran for a little over a day for me on a single charge, although at very low volume. Figure a few hours less if you're cranking it. As I said up front, you're not going to hear audiophile sound, or anything close to it from a small, long-running speaker designed for light travel and rough weather. But I find it hard to imagine one designed to those criteria that sounds better than the SoundCore 2 at anywhere near $40. While the sound can't compete with that of most larger Bluetooth speakers, you'd be hard-pressed to find anything that sounds better at the SoundCore 2's diminutive size and price.